On this season of the StoryCorps podcast, we’re bringing you stories about reuniting with people and places from our past. Sometimes those moments of connection are so extraordinary it can be hard to describe the feelings that surround them — the takeaways are intangible. But often, it’s the tangible things that allow us to reconnect in the first place. In this week’s episode, two stories about people reuniting with long-lost family treasures. From an Army Major who tracks down and returns military medals, to a son who finds his father’s beloved electric guitar 25 years after his death; we explore the ways that objects can live on after a person is gone, preserving, and sometimes restoring, their legacy. 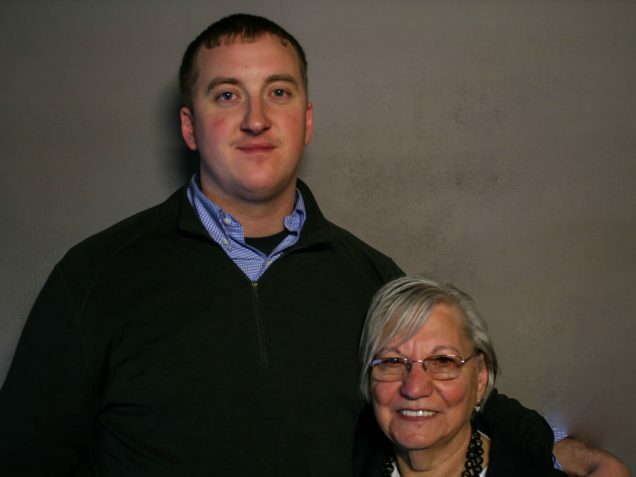 Middle photo: Army Major Zachariah Fike with Adeline Rockko at StoryCorps in April 2012. 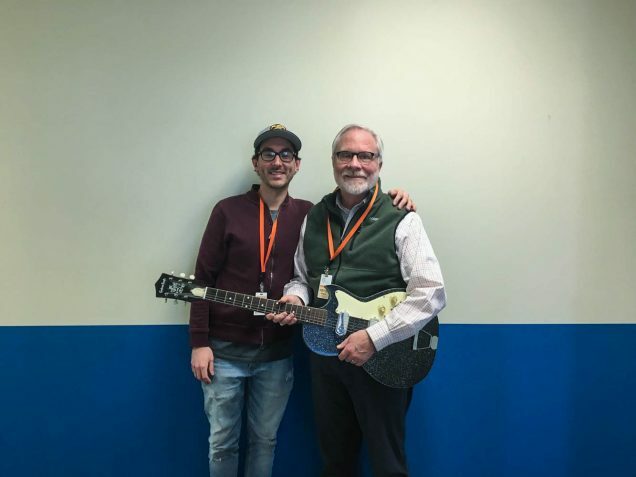 Bottom photo: Rodger McDaniel with his son-in-law Josh Jacobsen in Denver, Colorado after their StoryCorps conversation in December 2018. Adeline Rockko (AR): That night when you brought the medal down from your bedroom and I saw it was in the very same box that I had last seen it in, I knew it was in good hands. Zachariah Fike is a Major in the Vermont Army National Guard. He’s served in the military for 20 years… and he received a Purple Heart for his service in Afghanistan in 2010. But this wasn’t the first time he’d crossed paths with a purple heart. The year before… knowing Zac’s love of old antiques and thrift shops… his mother had given him an old purple heart for Christmas… It had an engraved name on the back… Corrado Piccoli. After doing some research… Zac learned Corrado had been killed in Europe during the Second World War. So Zac tracked down his sister Adeline Rockko to return the medal to its rightful owner. And they sat down together at StoryCorps… to remember when Zac first got in touch. Adeline Rockko (AR): I flooded him with questions. Bang bang bang. One right after the other. Zachariah Fike (ZF): ”What antique shop? Who are you?” She was very stern. So I called you right back again and apologized and thanked you then. Now this medal was very precious to my parents. And on special occasions, they’d take it out and let us touch it and hold it in our hand. And then my mother would put it back in the trunk in her bedroom. And for awhile I thought, Well, what’s the significance of this medal? But, as I grew older and missed my brother more and more, I realized well this is the only tangible thing that we have left. So I drove up to Watertown and met with you at your home. ZF: Yeah… At that point I knew you meant business. I mean, to drive eight hours to come see me. AR: That night when you brought the medal down from your bedroom and I saw it was in the very same box that I had last seen it in, I knew it was in good hands. And then you brought down your purple heart medal. ZF: Yep… I was wounded in Afghanistan. AR: And we got to know each other pretty well. ZF: We together have talked about planning a trip to Italy and maybe walk some of the ground that your brother would have walked during the war. AR: I would like to make that trip, really. We were very fortunate that you were the one who ended up with the purple heart and you’re part of our family now. JM: That’s Adeline Rockko with the man who found and returned her brother’s Purple Heart… Army National Guard Major Zac Fike. They haven’t made that trip to Italy, but it’s still something they hope to do someday…In the meantime, Zac went on to found the nonprofit Purple Hearts Reunited…which, to date, has returned more than 600 service medals to veterans and military families across the country. And because of Zac’s work, a bill has been introduced to Congress that would make selling Purple Hearts illegal. The act is named after Adeline’s brother Private Corrado Piccoli. For many, the New Year is all about looking ahead, but at StoryCorps, we also like to think of it as an opportunity to look back… That’s what happened when Rodger McDaniel came to one of our StoryBooths. Still… Rodger remembers one thing that always brought him joy: his father’s sparkly blue electric guitar. And what I remember, from my earliest years, were those Friday nights when he and his buddies would gather in the living room of our small home and they would each bring some form of guitar. There were steel guitars and electric guitars and acoustic guitars and bottles of whiskey. And they would sit around until the early hours of the morning playing their guitars and singing gospel music. And, dad died in 1969 in a one-car accident that was undoubtedly related to alcohol use. After his death we all searched for his guitar—that had really been a prized possession and had a lot of meaning for my brothers and me. Really up until that time, my dad’s alcoholism and the problems that it brought to the family had defined him in my memory. But it was that story of his old guitar that caused me to think an awful lot about the meaning of grace and forgiveness and how much more than his alcoholism he had been. …and after getting his dad’s guitar back, he tried to learn how to play it…unsuccessfully. So it sat in his closet for years. That is, until he got a guitar player for a son-in-law. Rodger McDaniel (RM): I wanted it to be with a musician. It seemed to me that was the best way to make sure that my father’s memory stayed alive. Josh Jacobsen (JJ): I remember feeling very honored, taking care of a piece of history that means something to your family. And, it just meant a lot to me… because you had a lot of trust in me. RM: I remember the first time I heard you play it. To hear music coming from that old guitar was more meaningful than… I may be able to convey to you. Do my grandchildren hear it? JJ: Yeah… they’re familiar with the guitar. And, I play it. And, my hope is that someday I’ve got myself a little family band [laughs]. RM: Yeah, he didn’t leave much behind. And I think, over years, when we tell the little ones the story about their great grandfather, that this will help them learn a little bit more about who he was. JM: That’s Rodger McDaniel speaking with his son-in-law Josh Jacobsen at StoryCorps in Denver, Colorado. That’s it for this week’s episode. It was produced by Jud Esty-Kendall, Sylvie Lubow and me. Our engineer is Michael Raphael, script editor is Danielle Roth. Our fact-checker is Natsumi Ajisaka. (ah-gee-sah-kah). Special thanks to Michael Garofalo. As always, you can leave a voicemail for anyone you’ve heard on this podcast. Give us a call at 301 744 TALK. And write us a review where ever you get your podcasts — tell us what you think. To find out what music we used in this episode and to sign up for your own interview… visit our website, storycorps DOT org. For the StoryCorps podcast, I’m Jasmyn Morris. Thanks for listening…and Happy New year.